Chadar Badni often referred to as Chadar Badar is a unique form of puppetry that is practised by just a few members of the Santal community. Practically extinct among the Santals themselves, it first came to the limelight around 1985, when cultural ethnographer Ravikant Dwivedi chanced upon it during a field trip to Dumka, in the Santhal Parganas of Jharkhand. Since then, a few instances of it have also surfaced in West Bengal. Chadar Badani often referred to as Chadar Badar is a unique form of puppetry that is practised by just a few members of the Santal community. Practically extinct among the Santals themselves, it first came to the limelight around 1985, when cultural ethnographer Ravikant Dwivedi chanced upon it during a field trip to Dumka, in the Santhal Parganas of Jharkhand. Since then, a few instances of it have also surfaced in West Bengal. 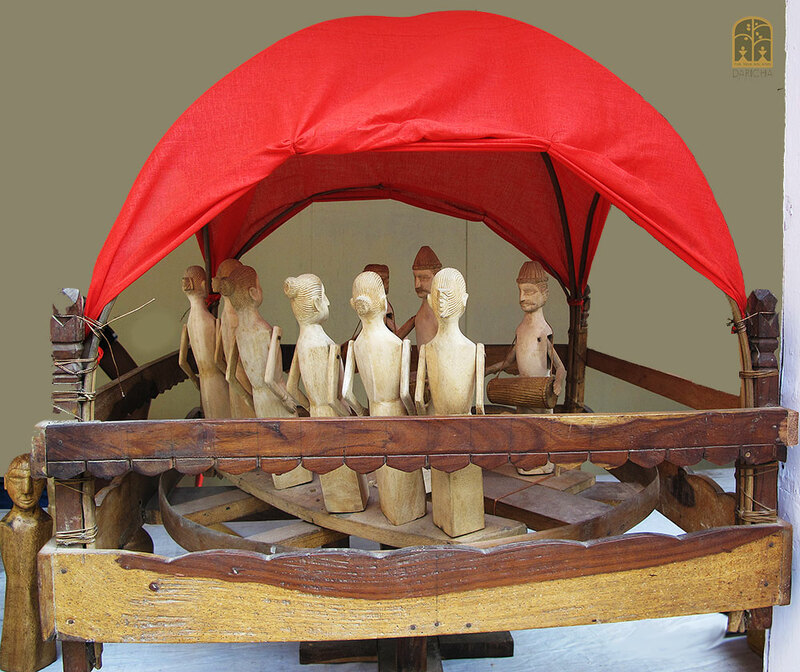 The Chadar Badani is the performance of a group of miniature wooden or bamboo puppets, 7" to 9" tall arranged within an intricately engineered wooden cage like structure, and manipulated by an amazing system of levers, sticks and a cord. To the rhythm of the puppeteer`s song, and accompanied by song, flute and drumbeats, the puppets are made to revolve, bob up and down, swing their arms and beat tiny wooden drums, in unison. 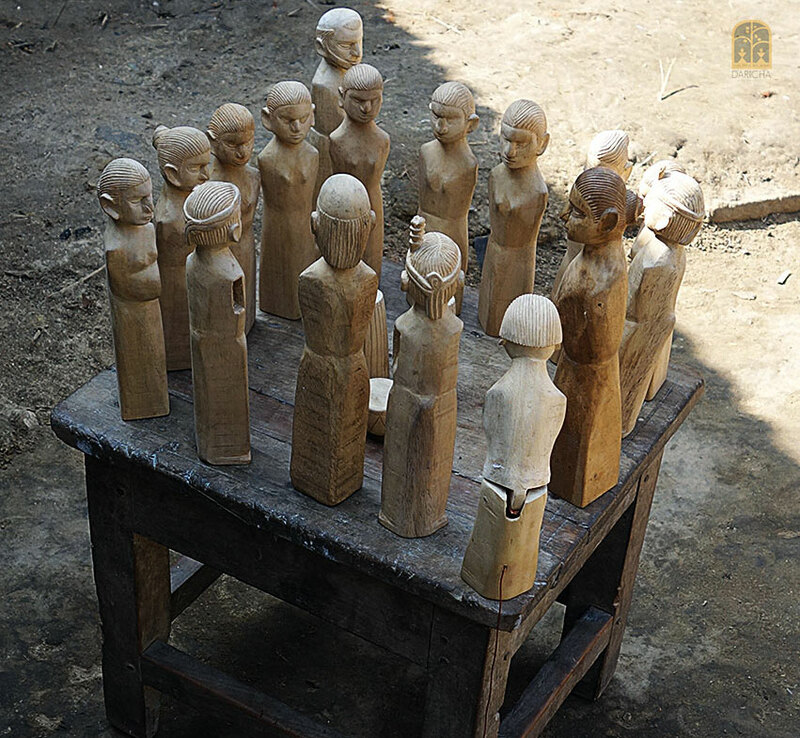 The scene is typical of any Santali dance performance, where the dancers and the musicians face each other. The end result, a rivetting, rhythmic Santhal dance that is almost surreal! 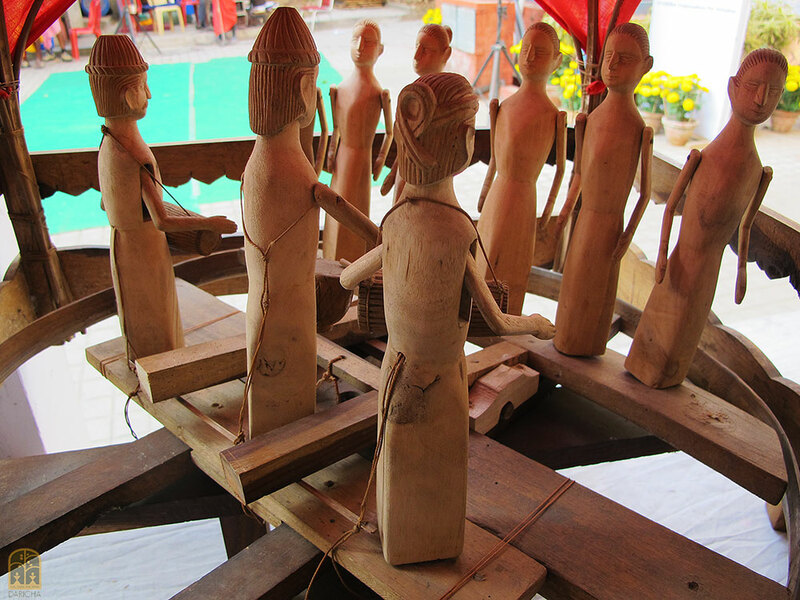 In its most basic form, male and female puppets are arranged on wooden plates on either side of a hollow central pole through which passes a cord that is tied to the main lever. The jointed limbs of the miniature puppets are attached to small sticks. The manipulator tugs the central cord which pulls the main lever, which in turn , pushes some sticks upward and some downward. Thus the puppets are made to move. The cord and the lever framework are curtained off on three sides with a colourful cloth, while a cloth awning is tied to wooden posts on the four corners of the outer wooden frame. It is believed that the name Chadar Badani is derived from this cloth awning (chadar) which is tied (bandhan) around the framework on which the puppets perform. Both the dolls and the contraption on which they are manipulated are usually made by the puppeteer himself. The workmanship and the mechanism vary from puppeteer to puppeteer. The entire structure rests on a central wooden or bamboo pole, which is held by one hand, balanced on the floor, stuck into the ground or even placed on a stand on a table. Thus the puppeteer can use either his hand or his foot to tug the cord and manipulate the puppets. The puppets are draped with bits of colourful cloth - saris for the women, dhotis for the men. They are usually painted with facial features and adorned with all kinds of finery - turbans and feathers for the men, beads and faux flowers for the women and so on. It takes several months to carve the puppets and build the wooden framework, levers and all. There could be as many puppets as the puppeteer wishes, but usually a minimum set of five to six female dancers and three male drummers, facing each other. These puppeteers usually perform during festival time - Dasae (Durga Puja), Sohrai and even Hindu festivals like Charok. 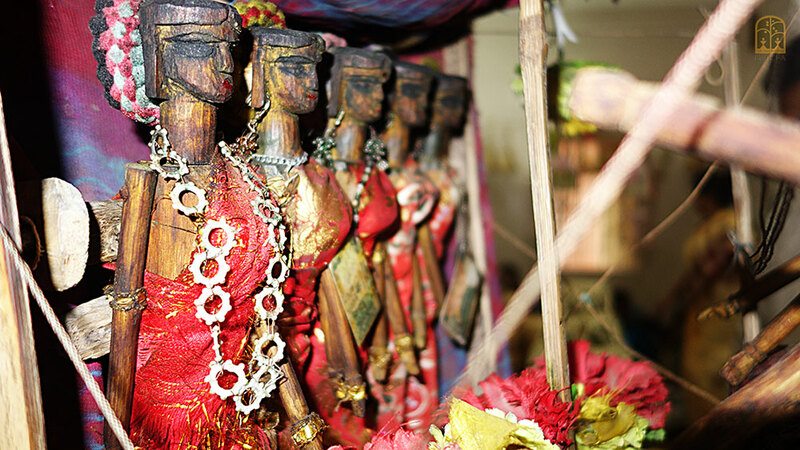 The songs that are sung are from the puppeteer`s imagination and woven around Santal life. There are just a handful of known exponents of this rare art in West Bengal. While Damon Murmu imbibed the form from visiting relatives from Dumka and has been eking out a living from it in and around his village in Uttar (North) Dinajpur since 2002, Sukan Mardi has been practising the form for the last 18 years. There is also Som Murmu of Birbhum, a master wood carver, who other than carving Santal instruments like the Dhodro Banam, also carves Chadar Badni puppets along with the platform. 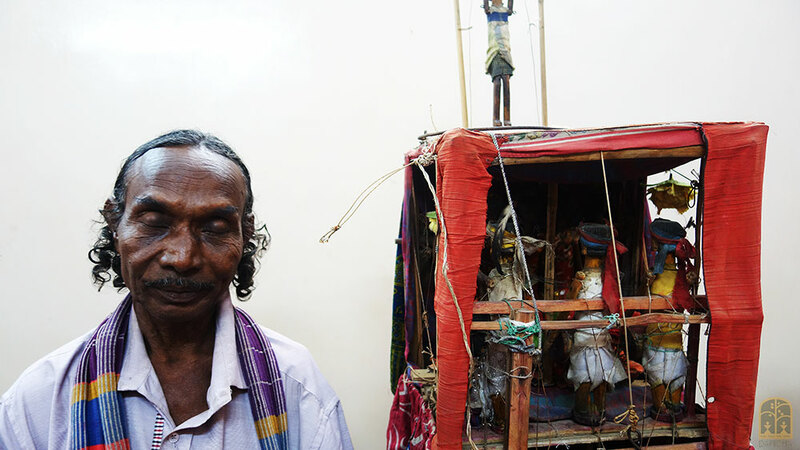 Som Murmu, who is known more as a wood carver, than a puppeteer, has been associated with Chadar Badni for more than 40 years! To his knowledge, this folk form has been around for more than 7 generations - he himself learnt from his wife`s grandfather, a craftsman called Tasok Hansda of Parui village. Tashok who would roam the villages with his puppets crudely carved with the limited tools at his disposal, had in turn learnt from his grandfather. Even then, knowledge was restricted to only a few. Som`s wooden puppets made from "Gamar" wood, are firmly fixed on a complex arrangement of wooden bars and levers that span a circular frame.  The circular frame in turn revolves within a square frame. The arms of the female puppets are attached in a way that allows them to swing gently with each tug, while the jointed arms of the male drummers are attached to strings which connect with the central cord. Som`s wizardry even has some puppets jointed at the waist. The puppeteer tugs the cord which turns the lever system, which in turn, rocks the bars in a see-saw motion, causing the puppets’ limbs to move and the circular frame to revolve. On the verge of extinction, some efforts have been made to stem Chadar Badani`s decline. In 2009, a four month workshop was held, under Dwivedi, where eight Santal youths were taught to make puppets with their intricate lever-controlled mechanisms by master trainers, including Som Murmu. 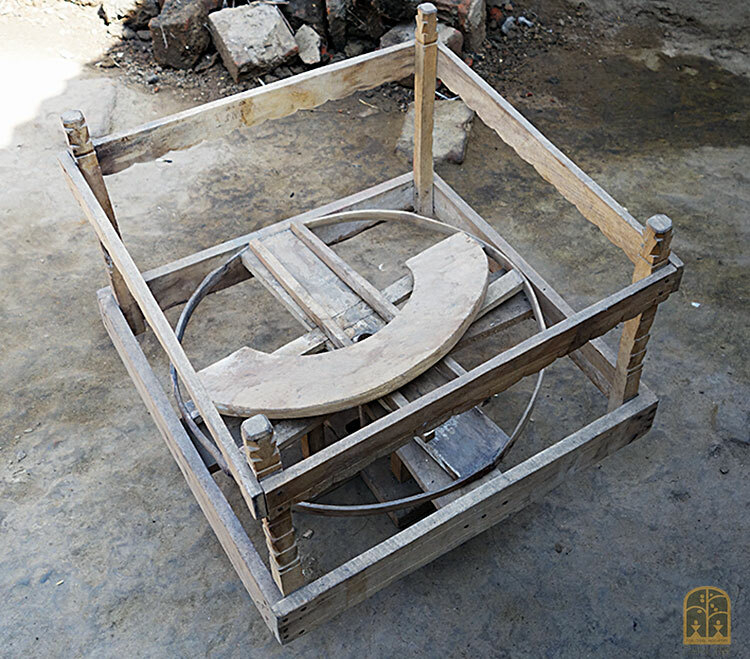 In 2015, Damon Murmu was felicitated in Kolkata by Anthropological Survey of India (Eastern Region) along with an NGO, Sambhav, in an attempt to bring some recognition to this dying art.